I never was big on Christmas jumpers. Tacky, boring, seasonal, really only appropriate for one month of the year... Or that's what I though - until I had a baby. Suddenly Christmas was a great excuse to get all kinds of adorable and cute thing for my little elf to wear, be that knitted little Christmas pudding hats to Mrs Santa outfits. 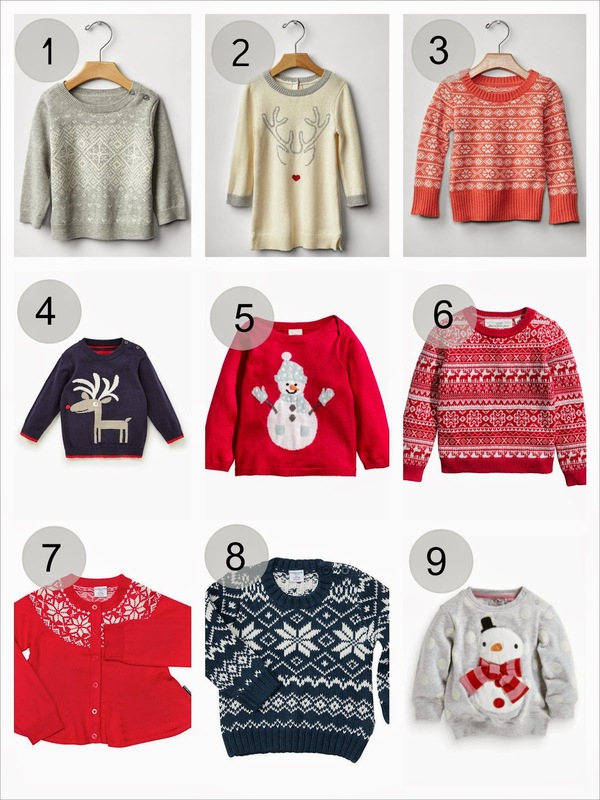 I've trawled through quite a few websites in the search of our 2014 Christmas jumper, and here is a selection of my favourite jumpers online. My absolute favourite Christmas jumpers for babies and toddlers are the more classical, fair isle knit type jumpers that work throughout the winter, not just through December. Characters like snowmen and reindeers are cute as well, but mostly I like the classical look. If you are looking for 2017 jumpers - check my post about Christmas jumpers for kids in 2017! We actually got one of these jumpers... And it is number 7 - adorable little girls cardigan by Polar O. Pyret. She wore it to see Father Christmas at the Harrods Christmas Grotto - more on that later! And I think a proper outfit pictures will come next week. What kind of Christmas jumpers do you like, and are you going to get any? Love a Christmas jumper! And have got us one each, ready for Dec 12th - National Christmas Jumper Day. I have come around this year - never used to like them but now... Whole different story. Matching mummy daughter Christmas jumpers... Dorothy Perkins, here I come! :D I would love to get something like that, I think it is so adorable to do matching outfits. Primark, of course. They do good stuff too, should check them out. I love number 2! Very cute!!! Yeah, it is a good one. Festive, Christmassy, but not tacky looking. We have just three, two for parents (and both are more winter than Christmas) and then one for the little one. Need some more! Little Owl has a very similar cardigan from LittleBird at Mothercare, it was a bit big when I bought it but I'm hoping she has grown enough now! I am so behind with this whole Christmas jumper thing, not a single one of us has one (not even old ones that don't fit anymore!) - but hopefully that will all change tomorrow as we've got one coming for Jumper Day (fingers crossed it arrives on time! ).